Dialogic, a cloud-optimized applications and infrastructure solutions provider for service providers, enterprises, and developers, announced today that in addition to the Application to Innovation (A2I) Summit event being held in Singapore on October 2nd, Jim Machi, Senior Vice President of Product Management and Marketing at Dialogic will be speaking at the TechXLR8 Asia conference on ways to enhance IoT with real-time communications. Jim will present “Enhancing IoT with Real-Time Communications,” and cover ways to layer real-time voice on top of IoT/M2M services to expand and differentiate offerings. 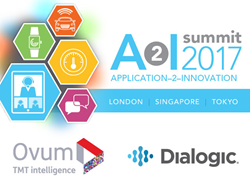 At the A2I Summit, a Dialogic event collocated with TechXLR8 Asia, Pamela Clark-Dickson, Practice Leader in Ovum’s Consumer Services research pillar, will be the guest speaker and host, sharing highlights from Ovum’s Digital Insights 2017 survey and discussing the next wave of convergence between AI, Chat bots, IoT, and customer engagement. Additional experts from Dialogic include Peter Kuckiak, Global Vice President Applications and Solutions, and Thomas Schroer, Senior Director of Marketing, who will elaborate on solutions that help service providers build innovative services for businesses and entrepreneurs to better engage their on-the-go, mobile workforce and customers. Other highlights of the A2I summit include exploration of new ways and modes of communication to enable context and intelligence sharing between people, entrepreneurs, businesses and the Internet of Things (IoT). The event will also look at the many ways service providers can leverage their networks to design, develop, test, pilot and deploy innovative applications and solutions. The A2I Summit on October 2nd, collocated at the upcoming TechxLR8 in Singapore at the Sands Expo and Convention Centre, will start at 1:30 PM local time. For more information, and to reserve your seat, please go to the A2I Summit Web Page. Dialogic is a leading cloud-optimized solutions provider for real-time communications media, applications, and infrastructure to service providers and developers around the globe. Based in Parsippany, NJ with offices worldwide, Dialogic helps 48 of the world’s top 50 mobile operators, and nearly 3,000 application developers build and deploy on agile networks. Learn more about how Dialogic is enabling agility by following us on Twitter @Dialogic, and visiting http://www.dialogic.com and the Dialogic Blog for the latest industry news, trends and advice. Dialogic is a trademark of Dialogic Corporation or a subsidiary thereof (“Dialogic”). Other trademarks mentioned and/or marked herein belong to their respective owners.